Sign up today for our free Monthly Market Report and keep tabs on the markets that interest you most! It’s easy to have the data you need delivered right to your in-box electronically. In your Monthly Market Report you will receive a market snapshot for the area you specified including detailed statistics provided by me. Search for homes, look for active real estate listings on a comprehensive map, or review the area’s market history by reviewing inactive listings. Your market report will be updated monthly for as long as you subscribe to our service! These updates are absolutely free with no strings attached. Because this is our neighborhood also, we can provide you with detailed information about our communities, cities, and state. We have a clear understanding of the local market, and an excellent inventory of homes. We also have full access to our Multiple Listing Service (MLS) so you can shop online from the comfort of your own home. Make a list of the homes you want to see and we’ll tour them together. Review zip code area market pricing details. Review area home and property listing details including size, amenities, number and types of rooms, renters vs. owners, and more. 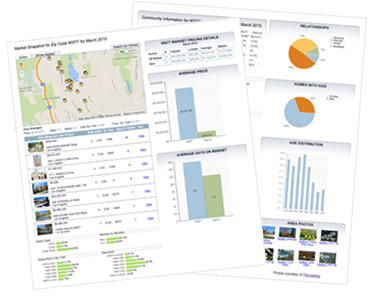 Get detailed community information based on reliable sources like the United States Census Bureau including demographics related to people, finances, housing prices and more. Examine common trends in pricing, days on the market, and local available inventory. Now is the time for you to keep tabs on the important markets that will influence your day-to-day life.